The first year established the pattern for the future. Minutes record that the first "parish meeting of the parochial electors of the Liberty of Newland" was held at the Reading Room in Church Lane on 4th December 1894 "(by the kind permission of Mrs Hargreaves of Arborfield Hall)", at what we would consider was a very early time of 6.30 pm. At this meeting, 18 Parochial Electors chose 5 men for the council, and these were listed as: George Kennard, Arthur Charles Tayler, Elias Trowbridge, William Vincent and John Simonds Esq. The Reading Room (now Reading Room Cottage) was without gas or electricity, and it is recorded that "2 shillings was paid to the caretaker for lighting fire & lamps, cleaning room, etc.". The first actual Parish Council was held 2 weeks later on 15th December in the School room at Newland's, the home of John Simonds, at the slightly later time of 7 pm. John Simonds was unanimously elected Chairman, a post he held until his death in 1929 when his son John Hayes Simonds was elected in his stead. George Garrett, the assistant overseer, was appointed Clerk. (John Simonds and Elias Trowbridge were Overseers - posts that pre-dated the Parish Council), The first real Council decision was "to issue a precept, from time to time, on the Overseers for payment of any moneys which may become payable, without at the present time appointing a Treasurer. Many of the meetings were dominated by the "Fuel Allotments, or Coal Charity". The income was £2.13.10 per quarter or a total of £10.15.4 per annum. It was decided that "no one should be entitled to receive the coal who had not resided in the parish one year." George Kennard and Elias Trowbridge were left to report on the different families in the parish at a meeting on Dec 20th at Newlands at 6.30 pm. Finally, the clerk was instructed to "ask Mr Wells to cart 3 loads of gravel to repair the footpath at the back of Mr Trowbridge's". The first annual Parish Meeting was held in the Arborfield and Barkham School room on Monday April 1st 1895 at 6.30 pm. The minutes report that "The adoptive acts were discussed but no proposition was made." The School, built in 1873 and provided with gas lighting, was subsequently used for all public meetings and most Council meetings (except some that were held in the comfort of Newlands, or of Newland Farm House - particularly in the Second World War when the School had no facilities for blacking-out). The caretaker, Mrs Emblen, was paid up to two shillings to light fires, etc. At that time, the school building was very small; the frontage was doubled in 1910 (the slightly different brickwork is still noticeable). Apart from a few cottages towards the Cross, the school was set apart from the main centre of population. The Parish Councillors then met a week later on Tuesday 9th April at 7 pm. Among the business was a cheque drawn in payment for 11 tons 5 cwt (hundredweight) of Cannock coal in lots of 9 cwt. to Messrs C & J Ayres of Reading. The Annual Meeting of the Parish Council was held a week after this on Tuesday 16th April at 7 pm. After this, there was no recorded activity until December 4th 1895 at 6.30 pm. The Clerk was requested to obtain the price of good Cannock Cobble coals from 3 suppliers - Ayres, Whatley Bros. of Reading and Gadd & Co of Wokingham. Also to enquire if the Churchwardens of Arborfield had the inclosure award documents for the Liberty of Newland in their possession (no, it later transpired that they didn't). The Clerk informed the Council that a bond of 2 sureties for £50 had been duly executed and forwarded to the District Council at Wokingham for the performance of his office as Assistant Overseer. In 1895, 26 families were listed to receive coal (the extra name was James Falconer), and the practice was for the names for the previous year to be posted on the Church door. By 1896, there were 23 recipients, followed by 22 in 1897 and 1898, 24 in 1899 including for the first time a "W Stacey", who lived "Near the Mole Inn". Descendents of this family eventually moved into Emblen Crescent. At its peak in 1906, 28 cottagers received 11 cwt. each, but by 1926, inflation had eroded the value to only 12 cottagers receiving 8 cwt. each. Messrs Ayres were always chosen to supply the coal, in some cases despite lower tenders being received from other coal merchants; the decision was not always unanimous. Indeed, in 1903, it was felt important to note that Mr Trowbridge proposed that Messrs Drake & Mount of Bracknell, who had tendered 10% less per ton, should supply the coals; no-one seconded this motion. The Hurst Allwright Charity was first mentioned in 1906. It provided for, among other items, firewood blocks and blankets. In 1910, it was recorded that the "Allrights Charity" provided nearly 8 tons of coal compared to 9 tons from the Fuel Allotment. In 1924, the Charity Commissioners proposed to make an alteration to the management of the Hurst Charities, separating the Ecclesiastical from the non-Ecclesiastical Charities. The Council Chairman John Simonds explained that there were 2 Ecclesiastical and 16 non-Ecclesiastical charities, together earning about £540 in that year. (By the way, Newland and most of Arborfield Cross was in the ecclesiastical parish of Bearwood as recently as the late 1970's, though for practical purposes, marriages and other rites of passage usually took place in Arborfield Church). The post of "Overseer" was abolished in 1927 under the Rating and Valuation Act. The holders John Simonds and Jesse Pitt Clatworthy continued as "Trustees" after this time. Very few houses had their own piped water supply. The White Well was thus an important consideration. In 1896, it was decided to put a new oak curb and lid, and to raise the brickwork one course higher. George Garrett was directed to complete the work at the cost of 23/- and to do any necessary repairs to the 'Steining' of the well. On April 15th 1903, a discussion took place as to whether a pump should be put over the white well, and ultimately the matter was left for the Council to decide, but the chairman was asked to write to the district council surveyor, asking him to meet him and other members of the Council to see if a drain and grating could be put there to catch drain water. When they met him, the Road Surveyor suggested that channel bricks be put down on the lower side of the well to run the splash water "into the existing drain thereat", the bricks not to be more than 2 feet beyond the well on the Road side. The next council meeting asked Mr. Garrett to do the work, and then voted to get White Well cleaned twice a year at 2/6 each time. After this, no mention of the well was made until 1915, when it was requested that the well be cleaned and the cover repaired. The bill for the repairs in 1916 was 6/6; bearing in mind that an Audit Stamp would cost 5/-, the Chairman offered to pay for it as long as there were no other expenses. It was then requested that the White Well be cleaned out twice a year (presumably this task had lapsed), but others thought this wasn't necessary. In 1924, "the Chairman reported that his attention having been called to the fact that in consequence of the making up of the Highway by the Berkshire County Council, the surface water from the road was turned and entering into White Well making the water unfit for use; he had (the matter being urgent) taken the responsibility of ordering the necessary alterations to be made to prevent this state of affairs continuing, without calling a meeting of the Council. The Council concurred in the action taken". In 1927, the drain taking the overflow from White Well was blocked and consequently the fronts of the cottages known as White Well Cottages were in a flooded condition. Apparently the major portion of the drain lay beneath the public footpath. In 1930, the lid was again in bad condition and needed replacing. By 1934, there was a crisis. At a special meeting called on 4th April, the chairman explained that a letter had been received from the R.D.C. stating that a sample of water taken from the White Well (a spring that had supplied the village for longer period than was known) had been analysed and proved to be unfit for drinking or domestic purposes. As the Parish of Arborfield was interested in the matter, Canon Anderson represented them at the meeting. Newland Parish Council then arranged for two samples to be taken for independent analysis. By the 18th, the Public Health Committee of the W.R.D.C. had taken steps to close the well "in the near future". The Parish Council asked for no action to be taken before the independent analysis was complete. At a meeting on 28th June, two reports were discussed; the first, a Chemical Examination from the County Analyst, stated that the water was fit for drinking and domestic purposes. The second, from the Pathological Laboratory at the Royal Berkshire Hospital, showed the presence of bacteria to a greater extent than it should, making it unfit for domestic purposes; however, the Analyst didn't consider it fair to condemn the water on one analysis because varying conditions of weather could cause increase or decrease of bacteria. At yet another meeting on 8th August, the Parish Council agreed to instal a pump and close-in the well, and to remove a catch-pit, in order for the W.R.D.C. to reverse the closure order. At the November meeting, the Clerk reported that, as instructed, he obtained a tender from Mr. Bullock of Wokingham for £15 and one from Mr. A Barker and Son of Arborfield for £12, which was accepted. The work had been completed and a semi-rotary pump was installed. This was not the end to the matter . . . In 1936, the Chairman reported that the waste-water drain had become blocked, and in consequence the front of one of the White Well cottages was under water. . . it transpired that the pump was frozen up. Later that year, it was again decided to give the well a twice-yearly clean-up, as the W.R.D.C. might take samples of water for analysis at any time. Footpaths were a vital part of life in the days before cars and buses; consequently, they were kept in reasonable repair. In 1898, the Clerk was ordered to employ a man to trim the edges of the footpath leading to the Church, in the Parish of Newland, and to gravel it. It was again mentioned in 1925, and in 1927, it was reported that the kissing gate and fence of the Church path had been repaired and painted. At the Annual Parish Council Meeting on April 15 1903, John Simonds, Chairman, having reported that he had ordered the stile on the foot path between the Village and the School to be repaired, it was decided that the cost be borne by the Council. The chairman was instructed to write to the district council about the bridge in Cole Lane. In the same year, a precept was issued for 10/- for payment of Mr Wells "for four loads of gravel & carting & putting on footpath at the back of Mr Trowbridge's house." By 1904, the footpath to the school was again giving trouble. A detailed proposal was accepted "that sufficient of the earth be removed (at the west side of the stile in field leading to the School) to allow the water to drain off, the earth removed to be thrown into the path, and a load of unscreened gravel put on the top of do., it was also arrainged (sic) that an additional slab (to widen the footway) and an extra post & hand rail be fixed at the side of do., Mr. Garrett was asked to do the work". In 1919, Mr Wade Isaac wrote to the council calling attention to the state of the stile at the footpath across his meadow, by the School road, asking for it to be repaired. Again, in 1927, the stile had to be repaired because it was a danger to the users, especially the schoolchildren. In 1908, it was decided to repair the path leading from the stile to the end of buildings at the back of Captain Wright's house. "Mr. A C Tayler and Mr. G. Bentley were requested to order the quantity of gravel required, Mr. John Simonds kindly offering to cart it." Messrs Brooks of Barkham wrote about the "raising of the stile of footpath, at the back of Major Harris's house". The council replied that "a Parish Council is authorised to repair or remove an existing stile or gate, if such alteration is necessary for the public, but they do not consider such to be the case with the stile you refer to." In 1913, Shinfield Parish Council complained to Newland Council about the dangerous state of the footbridge over the Loddon by Arborfield Hall. Newland replied that the bridge was not in the parish anyway, and it was believed that the W.R.D.C. had repaired it before. In 1917, Mr Dimond, a Councillor from Carters' Hill, spoke of the dangerous state of the footbridge across the brook in the lane near his farm, and suggested that the Parish Council deal with it. The meeting discussed liability, and decided that the W.R.D.C. had renewed and kept in repair the other footbridges at Hughes Green and Cold Lane (sic). By April 1918, Mr Dimond reported that the W.R.D.C. had repaired it. However, the footbridge "in the Holt wood" was again unsafe in 1922. Much heat was generated in 1921 when a stile had been placed at the Coombes Lane end of the Public Footpath across the corner of Bear Wood Estate in place of a wicket gate. The Estate bordered "Newlands" - where John Simonds lived. It was pointed out by him to Captain Jenks, Governor of the Royal Merchant Seamen's Orphanage, that "the Public were entitled to equal facilities as previously existed". After a few years, the Estate was eventually forced to re-instate the gate, which still exists today. In 1931, the three footbridges over the Mole Brook were again in a poor state. By this time, the County Council took over responsibility for their upkeep from the W.R.D.C., but their first efforts at repair drew complaints from the Parish Council, and the subject re-appeared in 1933 and again in 1936, when the bridge in Cole Lane was rebuilt by the County Council. The bridge in Holt Wood (Carter's Hill) was declared unsafe in 1937. In 1934, Mr Jarvis brought to the notice of the Council that Mr Isaac was keeping a bull in a meadow across which was public footpath. The Council considered that it was "undesirable that he should turn a bull into the meadow". The Chairman undertook in 1938 to communicate with the Governor of what had become the Royal Merchant Navy School "with reference to the overgrowth of the public footpath across the park from Mole Lane to Cole Lane" (actually - Coombes Lane). The stile (in Mole Lane?) was repaired in 1939, as was one near Birch House. Post-war (in 1947), motorbikes became a problem in Cole Lane, "rendering it almost unusable for householders living in the Coombes, and for farmers wishing to gain access to their fields on either side." In 1908, Newland Parish Council wrote to the W.R.D.C. "asking for information as to whether the road leading from Sindlesham Road by the Larch fir plantation to Berry Grove (sic) Carters Hill is a Public or a Private Road, as there had been complaints made as to its bad condition." The R.D.C. 's Highways Committee then stated that "the road in question appears to be a soft public highway and has not been metalled or repaired by the District Council". The poor state of this road was again mentioned in 1925; the area was written down in the Minutes as "Betty Grove", later corrected to "Berry Grove". Complaints about speeding traffic are nothing new. At the Annual Parish Meeting in 1910, Mr F W Seymour stated that he "considered the Motor Cars passed through the Village at too great a speed for the safety of the inhabitants, and proposed that notices warning the drivers to go slowly through the Village should be placed at the sides of the Main Road at both ends of the Villages", which was seconded and carried. The County Surveyor was contacted, who arranged to that "the Notices were duly fixed". In 1927, "the attention of the Council having been called to the dangerous condition of the pit on the frontage of Mr Geo. Bentley's property, the Clerk was instructed to request him to at once take steps to have the pit filled up." In 1931, Mr Dimond complained of the state of the road from near Carter's Hill Farm to its junction with the Sindlesham Road opposite Park Lodge. It was repaired by the County. After the Second World War, traffic was increased to the extent that footpaths were needed along School Road from the Cross to the school, and along Eversley Road from the Cross to Targett's Farm. The Council petitioned the W.R.D.C. in 1947. The road itself was in a state; pools of water collected at the Cross near the Memorial and the Green; there were still barbed wire entanglements at the Cross; sign-boards were still missing following the war; and the pond opposite the Bull was considered a nuisance. In June 1903, Newland Council nominated 3 electors to meet with 3 electors from Arborfield Parish and Barkham Parish to elect a manager for the School. - This meeting was held on 8 June at 7 pm., with Canon Anderson from Arborfield and Rev. Ditchfield from Barkham, plus 7 others. Mr Edwin Blake got the job. Mr Blake died in 1914, and another committee was formed with Arborfield and Barkham Parish Councils to appoint a successor. 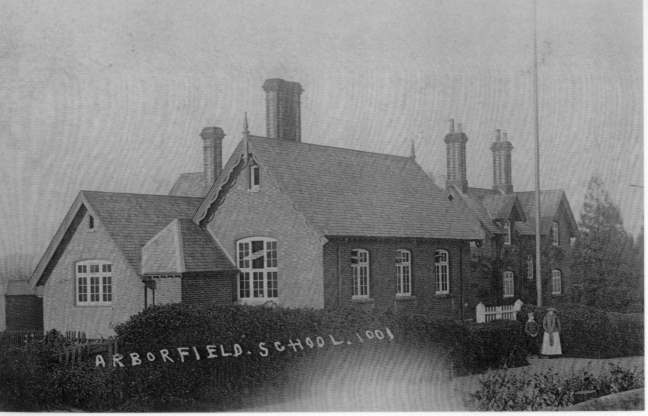 The Council received a letter from Shinfield Parish Council in 1924 concerning a Resolution they had passed "in respect of the suggested inadequacy of the educational facilities afforded by the County to the children in the villages of Berkshire in the matter of Secondary Education". After the Chairman had reported that he had interviewed the authorities on the matter and that it was made plain to him that they had the subject in hand, it was agreed "that the Resolution do lie on the table". By the way, it was not until the 1924 Council Minutes that the word "Newland" appeared to have been incorporated in the title "Newland, Arborfield and Barkham School" (note the order of wording, which causes confusion to this day in the Berkshire Record Office). In 1906, it was proposed "that in consideration of the great inconvenience caused to the poor of the Parish owing to their having in case of illness, to go to Twyford to obtain an order for Medical advice entailing on them a walk of 12 to 14 miles, the Board of Guardians be asked to transfer if possible, the parish as far as relates to poor Relief, and also the registration of Births & Deaths, from the Twyford to the Wokingham District.". The Clerk was instructed to forward the above Resolution to the Guardians of the Poor of the Wokingham Union. The letter was sent on 4th April, and a reply received on 25th April from the Wokingham Union that "having regard to the fact that there has only been one Recipient of Out Door Relief in the Parish during the last three years, and to the power of the Overseers of the Parish in giving relief in urgent cases, also that the Relieving Officer at Sindlesham evry (sic) Wednesday, and a letter posted in the morning would reach him in the evening of the same day, the Guardians cannot see their way to petitioning the Local Government Board to transfer the parish of Newland to the Wokingham District of the Union." Mr Garrett replied to the Clerk to the Guardians of the Wokingham Union on 30th April "I am instructed to point out that the grounds for their refusal . . . hardly appear to be cogent. There must have been more weighty objections than those you mention." Following a reply on 11th May that listed the powers conferred on Overseers by the Poor Law General Orders of 1842, the correspondence ceased. In 1909 the Clerk to the Guardians of the Wokingham Union requested to know the number of Midwives and nurses in the Liberty of Newlands. The council replied that there is no certified midfife other than the nurse supplied by Mrs Hargreaves (of Arborfield Hall), and no local association for providing them. The Clerk to Shinfield Council wrote to Newland and Swallowfield Parish Councils on September 1907 "with a view to ascertaining their opinion on the matter of combining in a joint action to procure some means of protection to lives and property in cases of fire in their neighbourhood. The district is rapidly increasing in new buildings and population . . . a meeting of the delegates from each Council can be arranged to go fully into the matter of ways and means. I am Dear Sir Your Obedient Henry Goddard". The council decided that "while thanking the Shinfield Parish Council for giving Newland Parish the opportunity of joining a Fire Protection Scheme, not to avail themselves of it". At this time, Shinfield's population was probably growing much faster than Arborfield's. In 1936, the Chairman interviewed the Chief Constable of Berkshire concerning the withdrawal of the Police Constable from the district. The idea was apparently to concentrate the police forces at various points throughout the county, and, on the receipt of a call by telephone, to dispatch a constable, or constables, to reach any given spot in the shortest possible time. The Council accepted this explanation and took the matter no further. A discussion took place in March 1908 on the "small Holdings and Allotment's Act", but as there had been no application, nothing was done in the matter. The subject was raised again in 1924, when a circular letter was received from the Ministry of Agriculture & Fisheries on the provision of Allotments in Rural Districts. It was again decided that there was no demand in the Parish, but that enquiries would be made by all Councillors. The Second World War caused another circular letter to be sent. The Parish Council was not aware of any request for Allotments, and knew of no waste land suitable for cultivation, but the Clerk was instructed to ask for half a dozen posters for publication anyway. The Members of the Arborfield Parish Council have from time to time discussed the desirability of having a playing field. Some time ago I saw Mr Isaac to see whether he would sell the northern end of his field across which a footpath runs diagonally between the School and the village. At first, he expressed willingness to discuss it but then said he would not entertain the idea. Recently, Mr Reilly, Secretary of the Berks, Bucks and Oxon National Fitness Committee met members of the Parish Council with me, to look into the possibilities. He did not like Mr Isaac's field because of the footpath. We therefore made a tour to shew him how very limited the level spaces are, and came to the conclusion the best possible site is on your property. I therefore promised to approach you to ask whether you would be willing to try to make this idea possible. Mr Bowyer is your tenant I understand, of this level site and naturally we do not know either what his feelings or your would be. The position is as follows. We believe the National Fitness Committee would contribute half the cost of acquiring the land levelling as necessary, of sowing grass seed, of fencing and of providing a pavilion. Mr Reilly would like us to have a plot 220 yards by 120 yards and I have taken the liberty of shewing the arrangement he suggested shown upon your land on the enclosed rough plan (no longer existing). Now the great thing is, please, would you and the Newland Parish be willing and able to cooperate in this scheme? I must tell you we have about £150 available that could be put toward the half share in this project". "I am directed to say that the members are quite prepared to cooperate with your Council in the provision of reasonable facilities for recreation for the inhabitants of Newland and Arborfield. "The scheme put forward by you, as set out on the plan you attached was, however, considered to be fantastically extravagant, and one which my Council are unable to support. "No provision of any sort is provided for children which, my Council feel, is of paramount consideration. Even if half the cost of layout could be obtained locally, a scheme such as outlined would require an annual expense for upkeep, out of proportion to the capacity of the inhabitants. "If, as my Council believe, a rate of 3d in the £1 could be levied, this would produce, say, £90 at most, insufficient to provide the wages of a full-time groundsman, whose services would, most certainly, be needed. "In addition, my Council is satisfied that the Highways Authority would never sanction an entrance directly off the Causeway or Main Road - the most dangerous approach to the village, and if children are to be catered for, it is urgently important that a ground for them should have reasonably safe access. "My Council would only support a scheme very drastically modified." 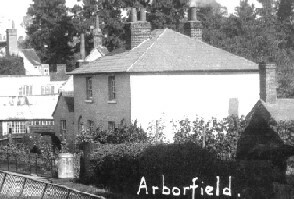 The correspondence led to a joint meeting in April 1939 with Arborfield Parish Council. It was agreed that "the present time was not propitious for going on with the matter and that it would be better to wait for a more settled time." The Berks. and Oxon Chamber of Agriculture asked in 1914 for information relating to the housing question in the district. The Council replied that "the number of houses was sufficient for the needs of the District", though this was due more to the benevolent nature of the Simonds family than the Council itself. The next mention of housing provision was not until 1930, when a letter from the W.R.D.C. was read to the councillors. It stated that the Housing Committee were considering a scheme for the erection of further Council Houses and enquired whether the Parish Council considered that there was a need for further houses in the Parish, and if so, what number, in their opinion, be erected. They replied that in their opinion the Housing Manager knowing the number of applications received for houses in the Parish, was in the best position to know whether further houses were required. In 1931, the Council appointed Mr. John Hayes Simonds to be their representative on the Council of Management of the new Village Hall when it was completed. [The hall was run independently of the two parish councils. It was actually sited in the Liberty of Newland, on land donated by the Simonds family]. At the 1914 Annual Parish Meeting, Mr G R Hayward complained that, although some parts had 2 or 3 postal deliveries a day, he & others living but a short distance from the Post Office had only one delivery, and asked that the Postmaster at Reading should be written to on the matter. In 1924, a letter was received from the Acting Postmaster of Reading, stating "that the Postmen employed at Arborfield Cross had made an application for a weekly half-holiday on Saturday afternoons to be afforded by suspending the evening letter-box collection in the whole of the Postal District served from that office, including Newlands. It was explained that under this arrangement the second delivery on Saturdays would be accelerated by about one hour, and the second despatch of letters would be at about 2.40 o'clock". The Council assented to this change. In April 1914, Mr Seymour raised the question of applying to the Authorities to install a Public Telephone Call Office in the village. This subject was delayed until the next meeting in March 1915, when the Clerk reported that he had written to the Authorities, and had received a reply. He also read out a list of 8 persons who had informed him that a Call Office would be useful to them. Apparently, a guarantee of about £15 would be required. In 1928, the Council passed the following Resolution: "Seeing that the Telephone Authorities are proposing to carry Lines up to the Village, and fearing that if carried on Poles, the beauty of the Village will be very much impaired, this Council consider that it is desirable the Clerk be instructed to write to the Public Telephones Department, asking that the wires be taken underground". It appears that this request went un-heeded. The Chairman offered to visit the villagers and ask them to comply with the request, while Mr Bowyer undertook to have the existing rubbish sorted and carted away at a later date, the cost of the sorting to be paid by the Parish Council. In 1929, the heap of rubbish had again assumed large proportions. A discussion ensued in which Mr Simonds remarked on the growing difficulties encountered by villages regarding the disposal of refuse. Mr Bowyer of Newland Farm and Mr Jarvis were appointed to make the necessary arrangements to clear the rubbish. They reported back that "it was of such a size that the sum of £3 suggested by the late Chairman for its removal was not sufficient to cover the expense and also, it was a difficult matter to find a convenient place to dump it". They nevertheless sorted and cleared it "at as low a cost as possible", though a year later, Mr Bowyer said that he was still unable to find a dump for the tins left over from the sorting of the refuse heap in Cole Lane. By the end of 1930, as the W.R.D.C. were now collecting the refuse, the notice in Cole Lane was altered to give notice that no rubbish be deposited. (In 1994, there was still a heap of garden rubbish at this spot!). In May 1942, the W.R.D.C. asked the Parish Council to appoint a Salvage Steward to assist and cooperate with the District Council in collection of Salvage in the parish. "Mr Verrall, the Schoolmaster, having, with the help of the school children, carried on the collection of Salvage for many months, was asked to attend the meeting in the school, and to give his help. This he did, and clearly explained the manner in which he had carried on, and explained that the task had got larger than he could manage. The W.I. was asked if it could help., and Mr Chitty offered the use of his yard for collecting scrap iron. "Sir, The Parish Councils of Newland and Arborfield at a joint meeting held on Friday the 9th January, desire to bring to your attention the inadequacy of the omnibus services between Arborfield Cross and Reading. (2) That the villagers of Arborfield must arrange their shopping expeditions at times which do not coincide with those when the majority of troops normally travel. (1) A 'bus service designed for a population in Arborfield and Newland of 600 (apart from the other places served on the route) is inadequate to deal with the addition of four permanent training camps with a personnel of some 5,000. (2) These camps are situated up to a mile on the south side of Arborfield Cross, and in consequence military personnel fill up the 'buses before the main centre of population is reached at the Cross. (3) The four camps are permanent training camps and so differ from combatant units in that many of the Instructors have their families either in the camp or in the vicinity and so the civilian population of the district has been increased. (4) There is no time of the day at which the service is slack. Military leave, both daily and period, is staggered, and certain personnel have leave at all hours of the day. For instance, London leave is usually granted at, or before, 10 a.m. That is the main cause of the recent aggravation of the difficulties of the local inhabitants, i.e. their inability to get to Reading in the earlier part of the morning. It is a frequent occurrence, as shown by evidence from our local Schoolmaster, for no buses to stop at Arborfield Cross between 8 a.m. and 4.20 p.m.
(5) It is not in accordance with the facts that villagers use the 'buses only for shopping expeditions or pleasure. There are several residents who are doing war work in Reading, both under the National Service Act and voluntarily, who find it increasingly difficult to get on to the 'buses in the morning and who are left in the Station Square in Reading an hour or more, because the queue is longer than he 'buses will accommodate. School children and teachers are similarly affected. (6) The Statement that our service is no worse than any other on the Thames Valley service cannot be borne out by ocular evidence at the Station Square, Reading. The Arborfield queue is by far the longest. (a) That on home or period leave the camps find their own transport for their personnel to and from Reading. (b) That a relief' bus should be run regularly on the 10.10 a.m. and 1.50 p.m. from Arborfield Cross, or alternatively that a shuttle service should be run at intervals between Arborfield Cross and Reading only. Our two Councils therefore urge that the problem may receive the sympathetic consideration of the Transport Commissioner with a view to amelioration of the present difficulties. We are, Yours faithfully, J H Simonds, Chairman, Newland Parish Council, and A H Capper, Chairman, Arborfield Parish Council". "Dear Sir, I am desired by Sir Henry Piggott to acknowledge receipt of the letter of the 11th January 1943 from the Parish Councils of Newland and Arborfield about the omnibus services between Arborfield Cross and Reading. Enquiries made by the Commissioner have confirmed that the difficulties are aggravated by the practice by the Military Authorities of granting London leave at or before 10 a.m. and the 'bus company is in consultation with the Military Authorities with a view to arranging the times of release of personnel proceeding on leave. It is hoped to obtain alleviation of the difficulties in this connection, failing which, efforts will be made by the company to operate one or two additional journeys between 9 & 10 a.m. You will appreciate, however, that the omnibus company is experiencing considerable difficulty with regard to the provision of additional vehicles & bus crews". "No. 1. That a notice should be placed at the Village stop showing the adjustment of times, to meet the needs of children going to Schools in Reading. At present it is 8.6 a.m., getting to Reading at 8.30 a.m. This is too early. The next leaves at 8.48 a.m., getting to Reading at 9.12 a.m., which is too late. Could you arrange one to run later than 8.06 a.m. but earlier than 8.48? No. 2. Ensure that the 'bus stops for the children. No. 3. Put up a queuing-up Notice. No. 4. Provide a shelter." There was no reply, and another letter was sent in July 1947, pointing out that "there were over 40 children needing transport which seemed to warrant a special school bus to run at a more convenient time than is at present the case." Some correspondence from 1896-8 refers to land in Newland which was actually in Wokingham. Sir, The attention of this Council has been called with the idea that the matter can be adjusted by the Council, to the case of a detached part of the parish of Wokingham. The part in question is shewn on the six Inch Ordnance Map, Sheet 38 and 46 lying between the south side of Bearwood Park and Arborfield Cross, and is lettered "Wokingham Detached, 57.450 acres". This piece of land is wholly surrounded by the Parish of Newland, and would therefore appear to have become amalgamated with that parish, as from 25th March 1883, under the divided Parishes Act, 1882, it appears however to have been always treated as a part of the Parish of Wokingham, and now, since the Local Government Act 1894, of the Parish of Wokingham Without, the rates have been levied by Wokingham, and persons residing in the area have been included in the Voters' and jurors' lists for that parish and the area seems to have treated in all respects as part of the parish of Wokingham without. The County Council appears to have the power to deal with the question and I am therefore directed to lay the matter before the Board, and to ask whether they can deal with it and if so in what form the facts should be submitted. Gentlemen, I am directed by the Local Govt. Board to forward to you the enclosed copy of a letter, which they have received from the Clerk of the County Council for Berkshire, relative to a detached part of the parish of Wokingham and to request that the Board may be furnished with your observations on the subject of that letter. Sir, In answer to your letter of the 31st ulto. we beg to inform you that as representing the Parish of Newland we are desirous that the detached portion of Wokingham lying within our parish should be attached thereto and that especially for two reasons. 1 To do away with the inconvenience of those living in the portion having to go to Wokingham to vote at elections whereas the Polling place for Newland is situated on the said portion. 2 That as the land in question is owned by two people only who also own land in Newland they have now the vexation of paying Rates & Taxes in two Parishes whereas if the portion were attached to Newland one payment would be sufficient. We would point out that there are no highly rated buildings, the whole being strictly agricultural land with four cottages & a school there is no incentive for Wokingham to wish to retain it, nor would Newland obtain any advantage financially by having it attached. Gentlemen, I am directed by the Local Govt. Board to advert to the correspondence that has taken place respecting a piece of land which has been treated as a detached part of the Parish of Wokingham Without, and to point out that the fact does not appear to be disputed ... etc. that it should be treated as a part of the Parish of Newland for all civil purposes. And so it was (though there were two more letters on 25th Jan from John Simonds and in return on 5th Feb). The two parishes worked increasingly together during the war years. A combined meeting took place on 26th November 1943, to draft a reply to a W.R.D.C. questionnaire regarding Post-War matters connected with the two parishes; since the two parishes were so intertwined, it was thought best to have a joint meeting. The Newland minutes merely report that most of the questions were answered, and that the "location of [Housing] Sites suggested was: Cross Lanes Farm, Arborfield, Eversley Road, Arborfield and School Road, Newland". "To Mr. A. Garrett, Clerk to Arborfield Parish Council. Dear Sir, re: Suggested Post-War Housing Sites: I am instructed by my Council to inform you that they have caused the sites suggested by your Parish Councils as suitable for housing purposes to be inspected. Furthermore, a tour of inspection of certain suggested sites has been undertaken recently by representatives of the Council, the Ministry of Health, the Ministry of Town and Country Planning, the Ministry of Agriculture and the East Berks Regional Planning Committee, in consequence of which the Council are being asked to accept the undermentioned Site as suitable for Post War Housing purposes, viz:- Land at School Road opposite the new Agricultural Cottages. A public footpath runs along part of this land from School Road to the Village. You will appreciate that in selecting this site, regard has been paid to planning considerations, accessibility to School, Village, etc., & the availability of public services. I am to ask if your Parish Councils have any observations to make on the proposed site, they will let me have their views not later than the 17th instant, as a Special Meeting of the Council is being held to consider this matter on Tuesday the 18th instant. Yours faithfully, Geoffrey Heath, Clerk to the Council"
John Hayes Simonds replied, because "the Site in School Road . . . is situate in the Liberty of Newland.". "Dear Sir, A joint meeting of the Parish Councils . . . met yesterday . . . A full and frank discussion took place and it was agreed that the site is suitable for the limited number of houses which may be found to be needed in the centre of the Area, after the War. At the same time, it is appreciated that the area comprised in the two Parishes is scattered and accommodation will probably be needed in the more outlying parts. Both Councils have for some time seen the urgent need for the provision of a children's Play-ground closely adjoining the School, and the site mentioned in your letter is felt to be by far the most appropriate. In the opinion of the Councils it would be essential if the site is acquired for housing that the layout be so arranged as to embody, not only a playground, but also a portion for School garden plots which, up to the present time, have had to be found a long distance from the School. Both Councils are most anxious to retain the character of the Village, and are strongly opposed to any form of ribbon development; they would prefer any building to be erected on the proposed site to be placed at the North West end, possibly in the form of a crescent." Few complaints from parishioners at Annual Parish Meetings were recorded before 1914, which is not to say that they weren't aired. In that year, there was a complaint about different levels of service for postal deliveries. At the same meeting, Mr Jonas Isaac complained of the state of the pond near his farm, and suggested that "it was the duty of the Parish Council to see to it's [its?] being cleaned out". 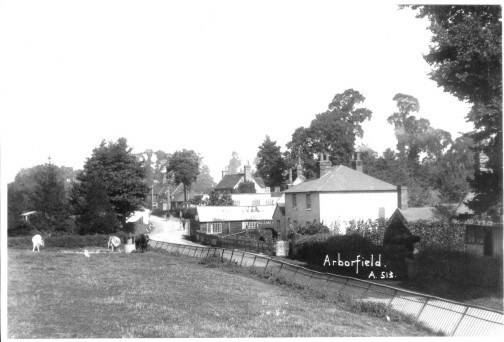 The clerk pointed out that when the pond at Arborfield was cleaned out under the direction of the Arborfield Parish Meeting, and the Accounts were brought before the Government Auditor, the Council was warned that the Parish had no right to clean out ponds; such work was an R.D.C. matter, and if the Parish undertook such work in future, the Overseers would be surcharged the amount to be paid. After 20 years, in 1914, the Chairman remarked on the small amount of interest taken in Parish affairs by the Parishioners during the whole time since 1894. There was rarely a need to have a ballot to elect Councillors. In 1931, the Annual Parish Meeting consisted of just five Councillors who were re-elected, and the Clerk (then George Garrett).